UB on the Green Returns! Grab your lawn chairs, a picnic, and the whole family to join us Wednesdays July 19 and 26 from 6-8pm on Hayes Hall Lawn (UB South Campus). 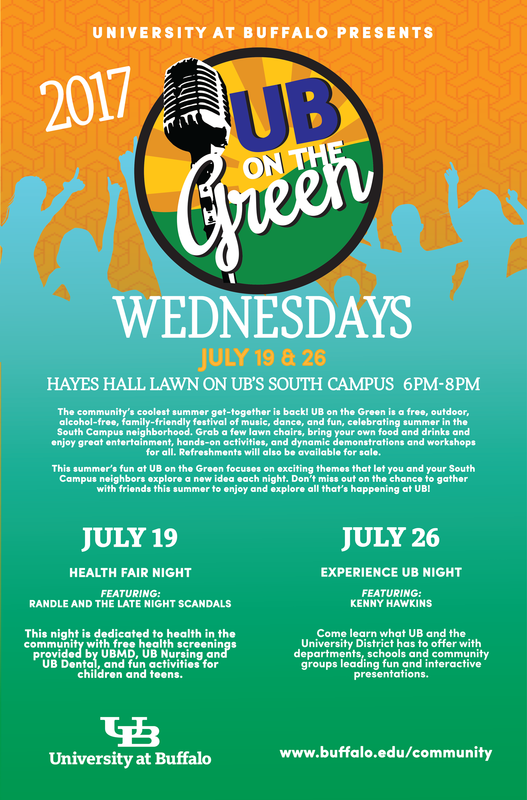 UB On the Green is a free outdoor summer concert series celebrating the South Campus neighborhood. July 19, 6-8pm – Health Fair Night featuring Randle and the Late Night Scandals: A night dedicated to health with free health screenings, fun activities, and more. July 26, 6-8pm – Experience UB Night featuring the rhythmic grooves of Kenny Hawkins Band: Come learn about what UB and the University District has to offer with fun and interactive presentations!